If you asked me to go back to 10-12 years ago and recollect which dessert my mom was an expert at, it would be the Flan au Caramel hands down! On Sundays when she would ask me to get a heavy stone from the garden, I knew what was waiting for me! Or what I would eagerly be waiting for! What? You ask me what is the stone for? At the time, she would cook the flan in a pressure cooker, and to seal the pan with the custard very tightly, when roast strings would fail, she would place a heavy stone on top of the lid! She made me fall in love with her Flan au Caramel! Yes, I would wait until every second Sundays to be able to have the best bite of heaven! Well, I maybe exaggerating on being crazy about a simple dessert like Flan, but would you believe me if I told you that last Sunday I made this, and had all of the 6 ramekins, all of them, by myself? I love flan this much! Especially this Flan au Caramel!! I would be more than happy if you would try this out and share your experience with me! Have 6 ramekins ready on your counter. Set a small saucepan on low heat and add the sugar and the water to make the caramel. Do not stir the caramel, and please do not use any metal spoon! Turn off the heat when the caramel turns deep golden in colour. Carefully pour equal portions of the caramel into the ramekins. Swirl the ramekin, to evenly coat the bottom with caramel. Let stand for 5 minutes. Mix well and then add the mixture to the rest of the milk. Combine the milk mixture with all the other ingredients in a blender and give it a whizz. Strain for air bubbles and equally divide the mixture into the ramekins. Place the ramekins in a deep baking pan (a roast pan will do) and pour water up to 2/3 way of the ramekins. Transfer the baking pan into the oven and bake for 60 minutes or until a knife inserted in the centre comes out clean. Slowly and carefully remove the ramekins from the baking pan and allow to cool to room temperature before popping them in the refrigerator for atleast 2 hours. Yesssss! It's as easy as that ! I use milk powder whenever a recipe calls for milk. So for this one, I made the milk thicker than usual. 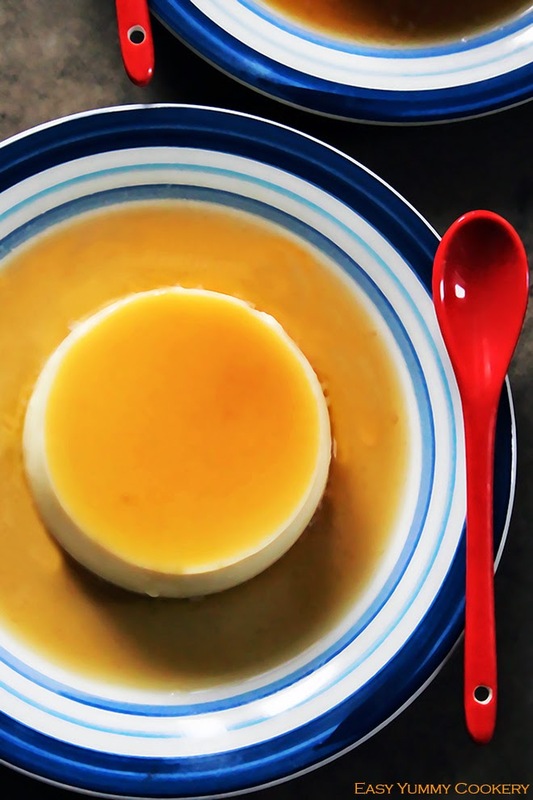 It gives the flan a richer milky consistency. If you're using liquid milk bought in cartons or gallons, and if you have milk powder (if you don't, go ask the neighbour!!! ), I will suggest you add 1-2 Tablespoons to get a slightly thicker consistency. 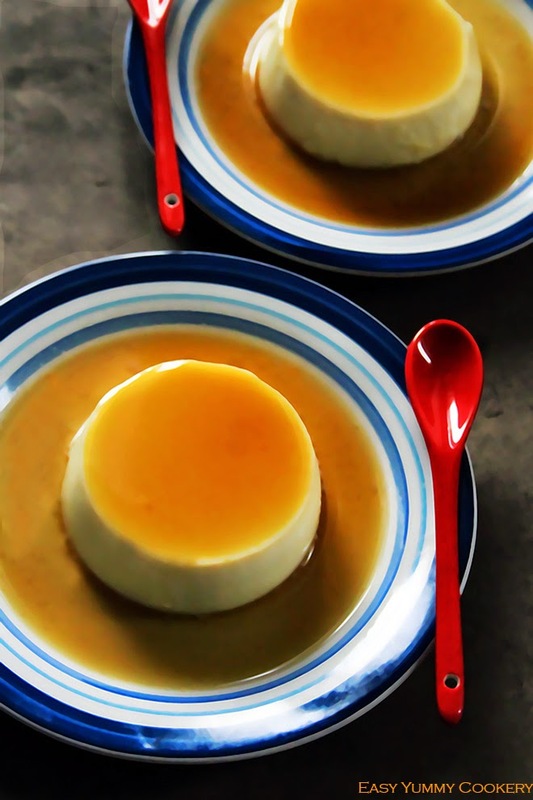 The traditional Mauritian flan is usually cooked in a bain marie or in the pressure cooker. The thing with these methods of cooking is that the water ends up boiling which causes the big holes around the flan. That is exactly why I prefer baking my flan. If you're not after an aesthetic look go ahead with the former methods. Absolutely divine....... Looks delicious and tasty!! Soo delicious and irresistible flam au caramel..loving it.